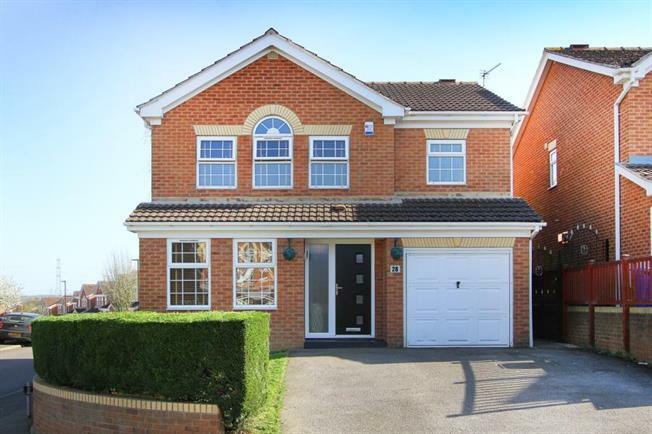 Only upon internal inspection can this superb four bedroom detached executive style family home be fully appreciated. Immaculately presented throughout and boasting ample family living accommodation. We strongly recommend an early viewing to not be disappointed. In brief the accommodation comprises: To the ground floor the generous entrance hallway gives access to the Cloakroom/W.C , Living Room with contemporary feature fireplace, Separate Dining Room, fully fitted modern Kitchen with integral appliances and complimentary splash backs. To the first floor the master Bedroom boasts a superb modern En Suite, three further bedrooms and the family Bathroom. The property stands in well maintained gardens, with a double drive to the front giving access to the integral single garage. To the rear is a larger than average landscaped garden with paved and further timber decked patio areas with further entertainment bar area ideal for Al fresco style dining. Woodhouse and South East Sheffield is popular with buyers of all ages, boasting excellent local schools and amenities. The area is located between Junction 30 and 31 of the M1 Motorway network with further access to the M18 and A1. Sheffield Super tram runs through the area and offers fantastic links to Sheffield City centre, Sheffield Train Station and across to the North of the City, Sheffield Arena and Meadowhall. Rother Valley Country Park and Ulley Reservoir both offer excellent outside pursuits and local walks and picnic areas along with the Pennine Trail which runs through parts of the local area. Stunning local surrounding Derbyshire countryside is just a stone's throw away.